Koi Saechao has been an artist with the Enrichment Center for 8 years. When teachers ask her what color she wants to begin her palette, Koi always begins with “green”. Each additional color she asks for is also “green”. This might seem like a limitation– a one color palette, but it is not. Everything can be green with some color adjustment. When Koi is beginning a new canvas, the visual arts teachers mix various shades of green in acrylic. Koi gets a brush, a cup of water, an apron, and she paints. She does not look at her canvas while she works, instead chatting with and making observations of the people around her. 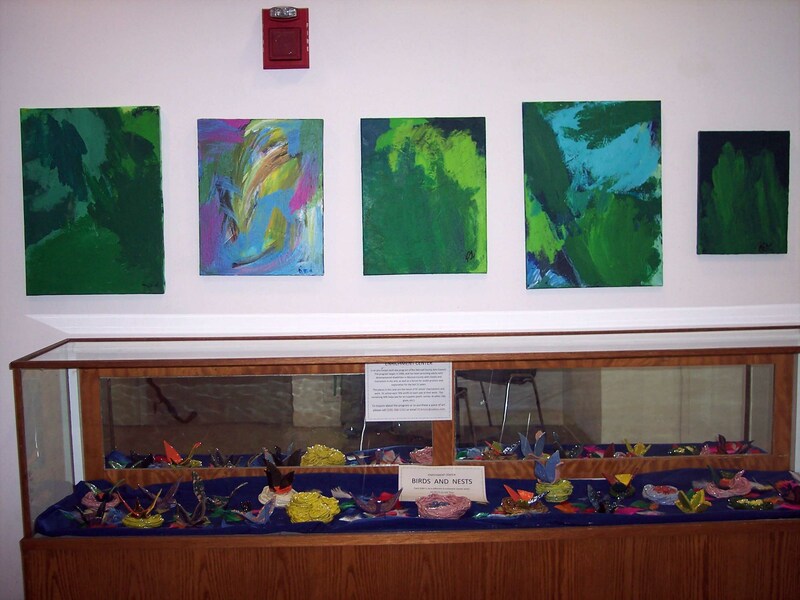 Koi’s explorations in green paint are being featured on the 3rd floor landing of the Multicultural Arts Center. In the case below, the clay/ceramics’ class is displaying “Birds & Nests”.